It’s Big Game season! Are you ready for it? I SO am. 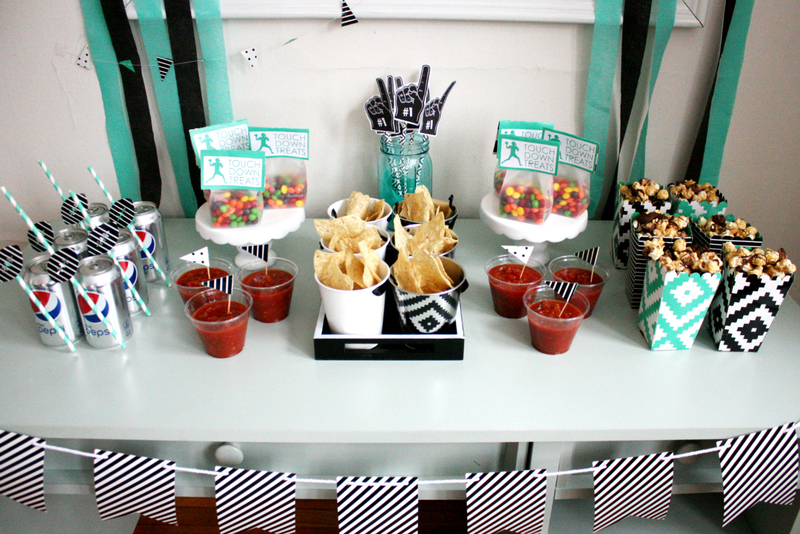 Honestly, I don’t follow a single football team but I am always in if there is a reason to party with chips and salsa. So, today I’m showing you how to throw together a Big Game Party with a little sass and style for all of my people who care more about the food table then the score (this party isn’t just for dudes, y’all!). 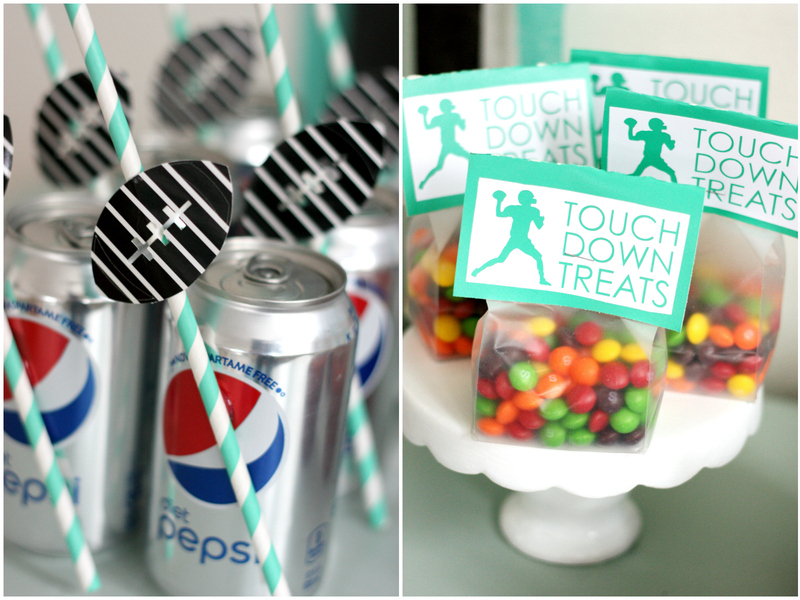 Plus, we are teaming up with some of our favorite brands, SNICKERS®, Skittles®, Pepsi™, and TOSTITOS®, to make it a party so delish your team could lose miserably and you’d still be celebrating. 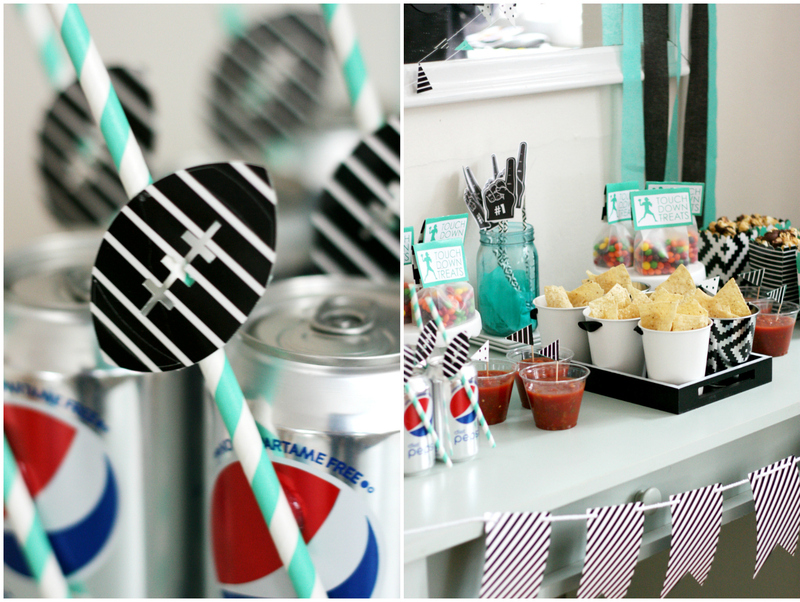 Whenever I’m planning a party, the color scheme is my priority. 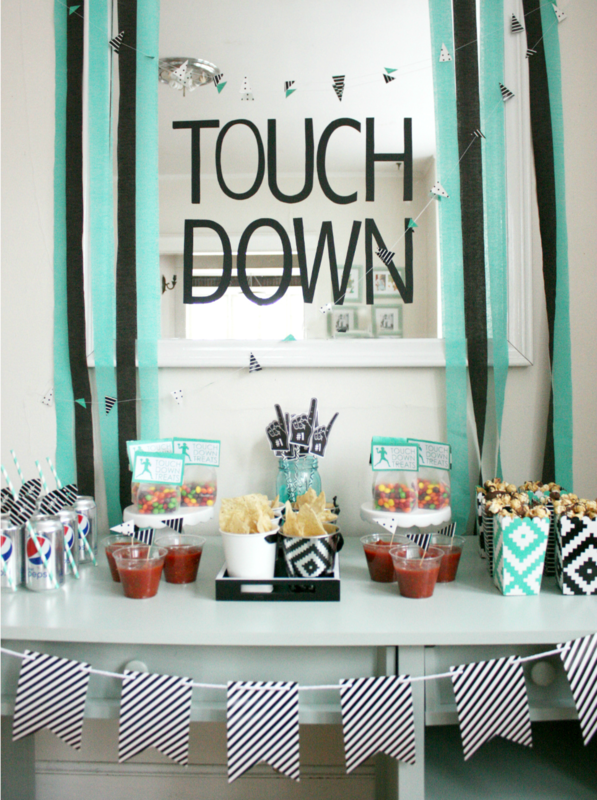 Every football party you’ll ever see on Pinterest is full of grass green and pigskin brown and I wasn’t having it, so when I found some fun black and and white and turquoise-ish green I knew our theme was set. 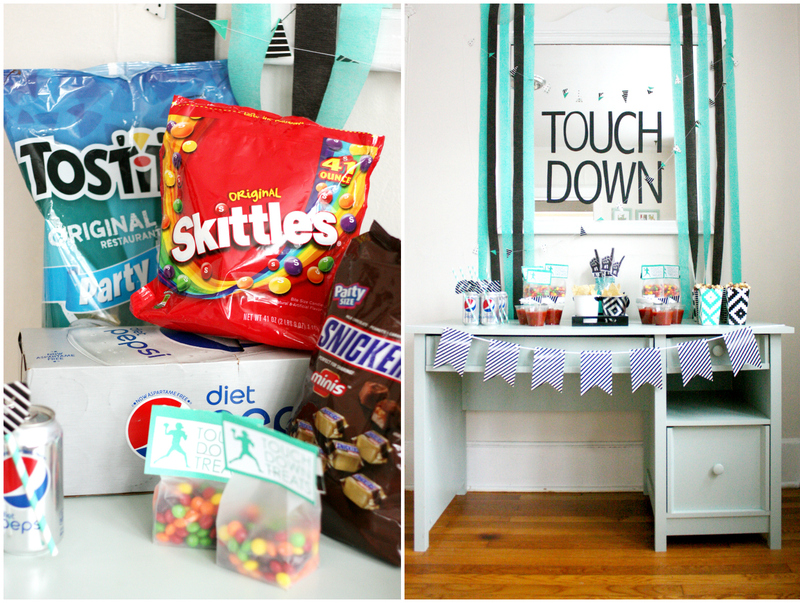 Who says football parties have to look like the inside of a sports bar anyway? Give me cute or give me death. 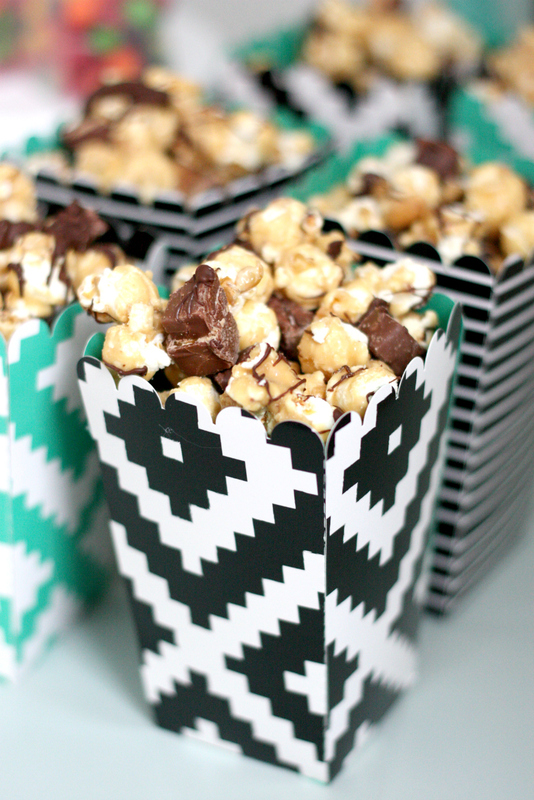 These popcorn boxes were my favorite touch! I have found that if I can’t find the boxes and supplies I need then I can just find paper I love and make them myself! These babies were a piece of cake to make by zipping through my Silhouette. Keep scrolling for a mini tutorial. 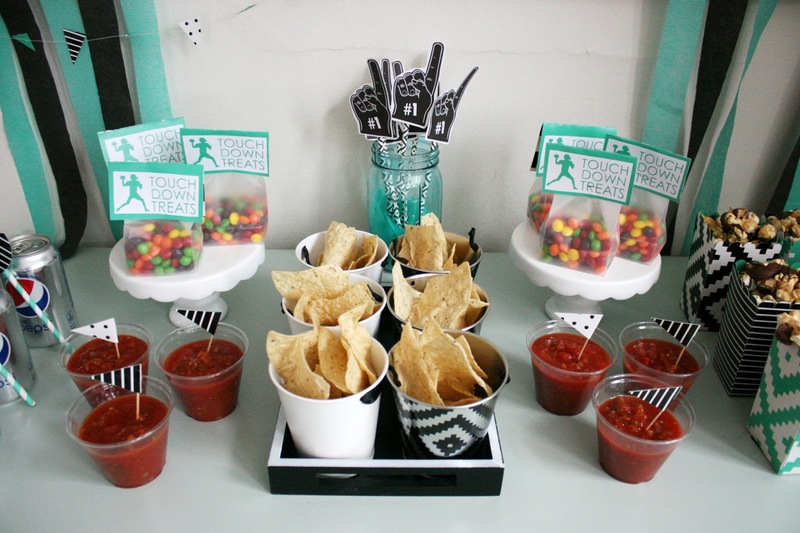 That’s one cute party for the big game, RIGHT? 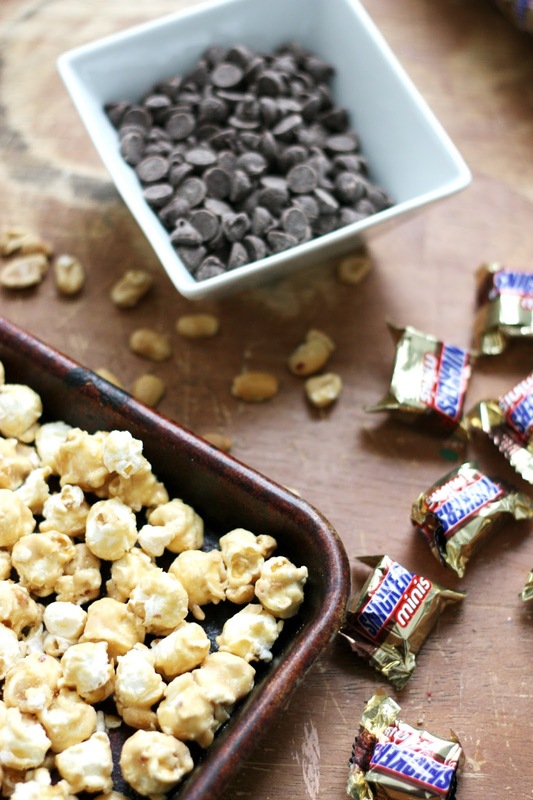 Click the “continue reading” link to see more about how we put it together, find an AMAZING recipe for SNICKERS® popcorn, and more fuuuuun. As usual, using my Silhouette to cut everything made my life so much easier and cuter. 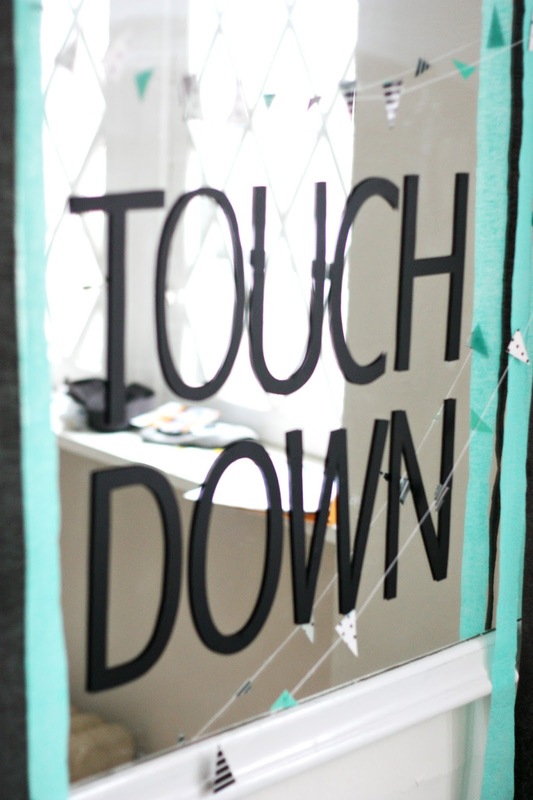 I used it to cut these footballs that I tacked on to straws, I used it to cut the pattern for the popcorn boxes and then I glued them together, I used it to cut out the stickers for the “Touchdown Treats,” and I used it to cut the vinyl lettering for the mirror. 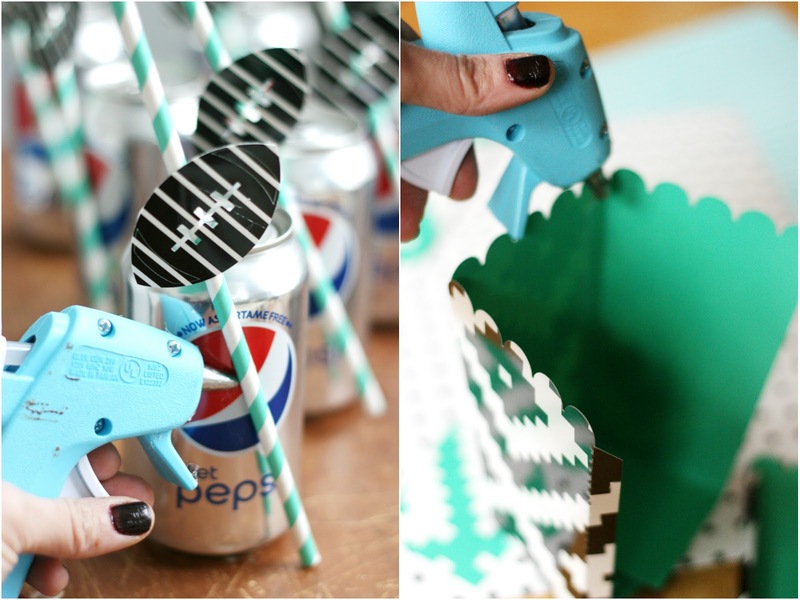 For a girl who can’t cut a straight line, that machine is a party-planners miracle. 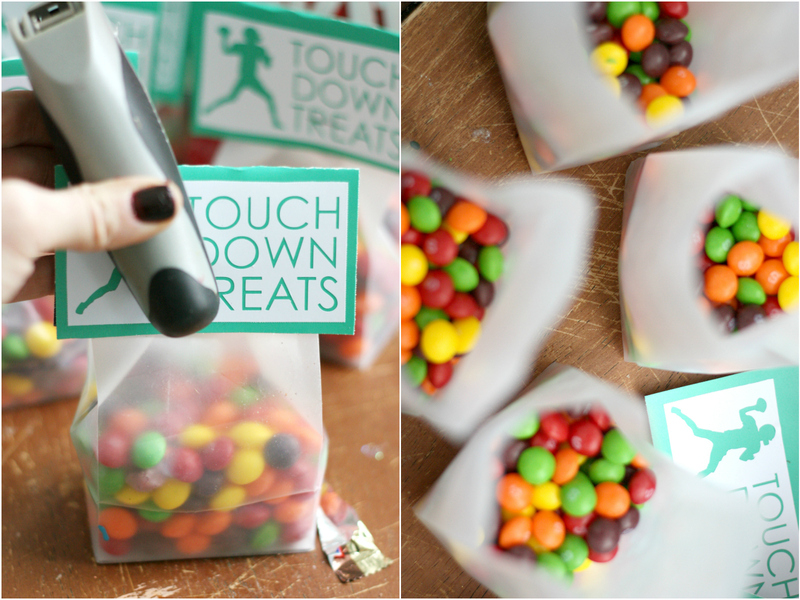 These “Touchdown Treats” turned out so fun! I love the colors of Skittles® and they were a perfect tasty addition to the table. Using vinyl for this part of the decor was my favorite! You can use it to make an oversized statement that is easy to put up and take down with minimal mess but a big impact. 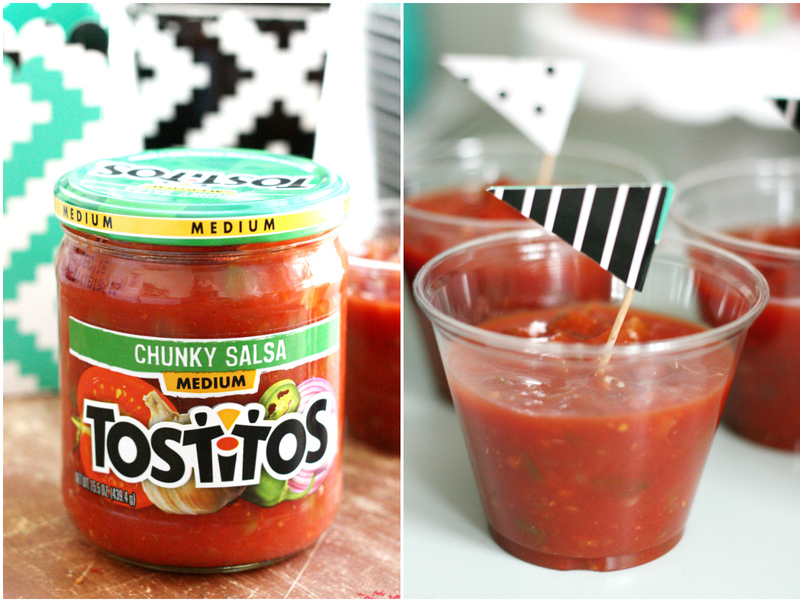 AS IF my TOSTITOS® salsa and chips need dressing up (they are perfect just the way they are), I still couldn’t help myself and cut out these little flags and stuck them in the salsa with toothpicks for a special touch. Let’s get to the good stuff! I like to keep all of my food choices simple at my Big Game party since I want to enjoy myself and this recipe could not be more perfect. It is simple to throw together but makes a major statement. It’s the perfect mix of salty, sweet, crunchy, and indulgent, plus, there are SNICKERS® in there, so SIGN ME UP. Over medium heat boil butter, brown sugar, salt and corn syrup for 5 minutes. Remove from heat and stir in your baking soda. Pour over your popcorn and stir to coat evenly. Transfer to waxed paper lined counter and sprinkle peanuts on top. Stir until all is coated evenly. 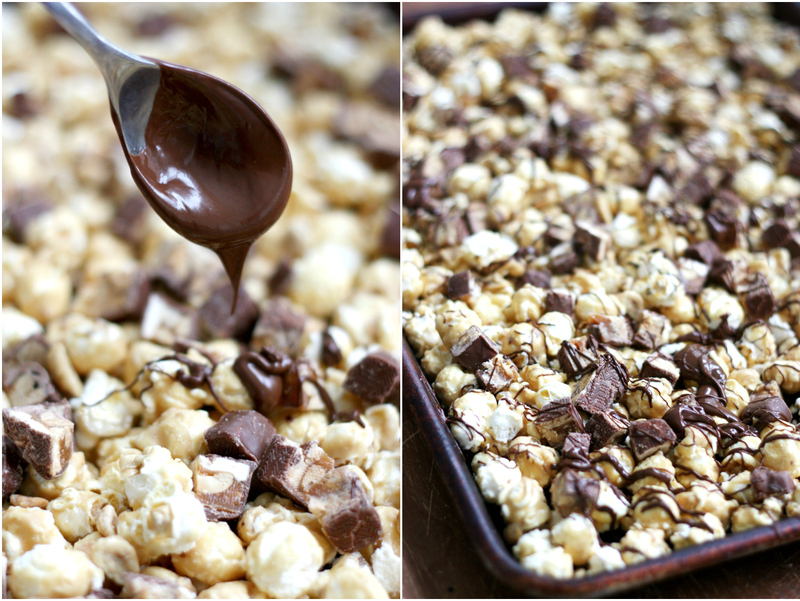 Transfer popcorn into a large roasting pan and bake for 1 hour 15 minutes, stirring every 15 minutes. 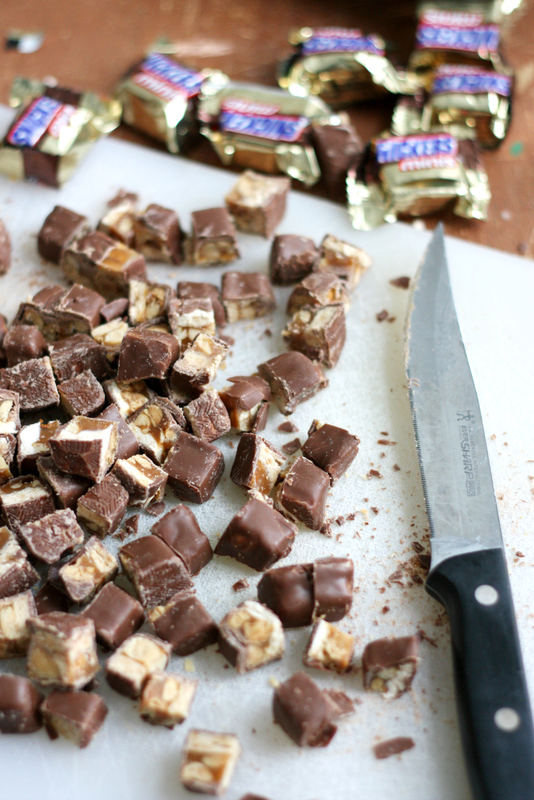 Remove from oven and stir in your coarsely chopped SNICKERS®. Return to oven for 3 more minutes so the SNICKERS® melt slightly into the popcorn. Remove from pan and transfer popcorn back to wax paper to cool. 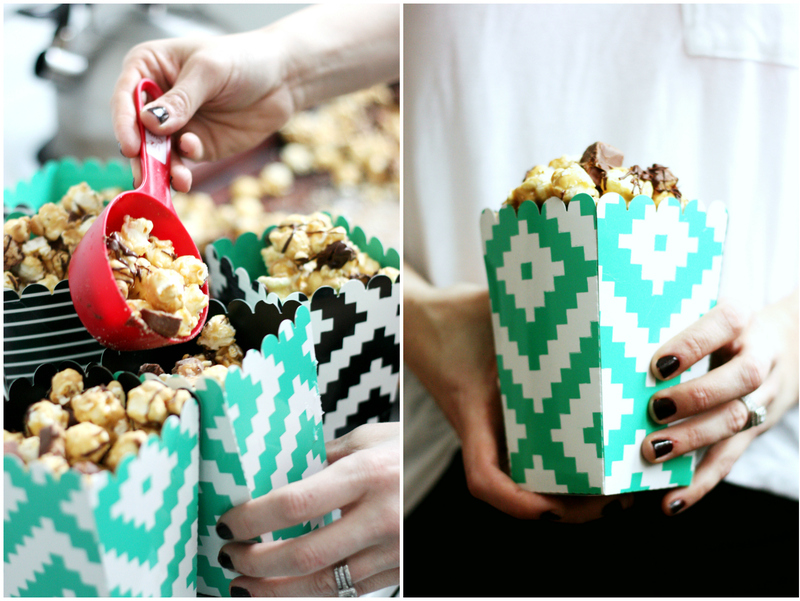 Drizzle melted chocolate on top of popcorn if desired. Let set and store in an airtight container. Could you die and go to Big Game heaven? That popcorn in those boxes is taking me there. 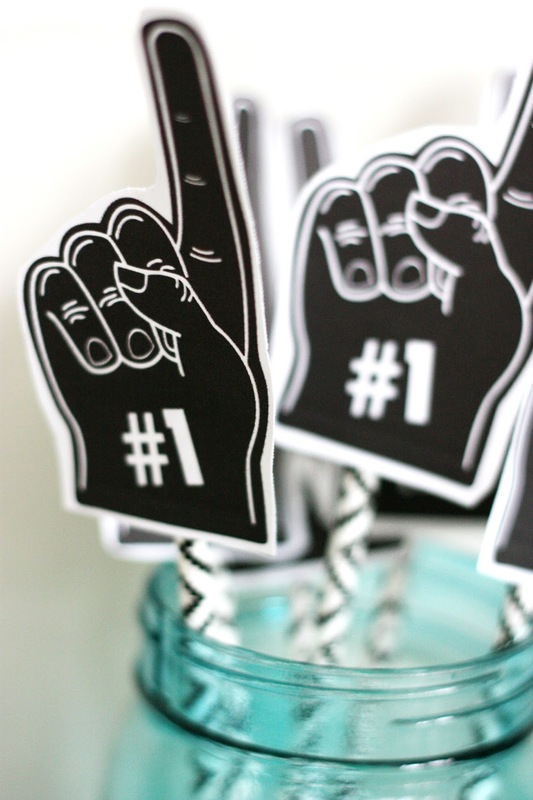 What are your party plans for Big Game season? You know what to do! To the comments! 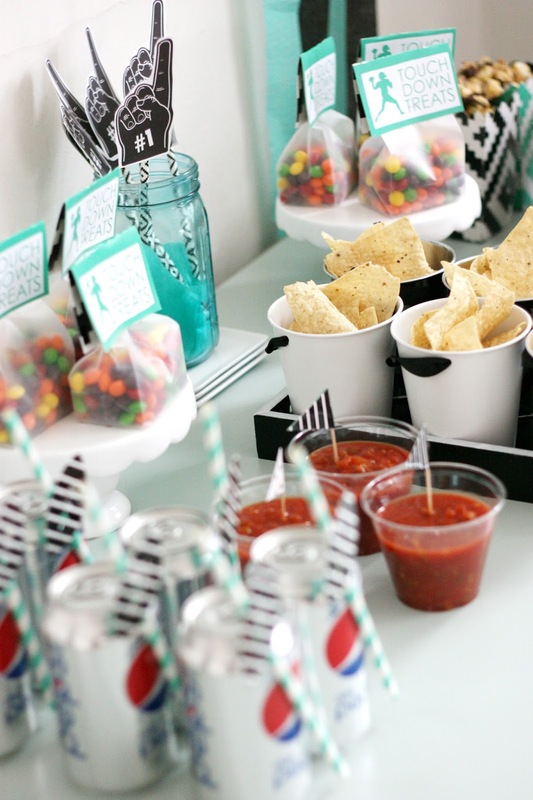 Your party is so stinking cute! I'm obsessed with your decorations and color scheme! Ah! Love the girly flair to an otherwise "man's day"! !